New Elite Force EF 2013 Speed Loader - 40 rounds at a time. 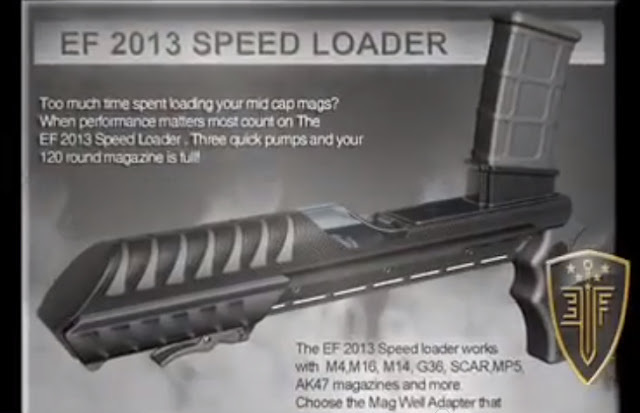 New for 2013 is a unique and somewhat controversial item, the Elite Force EF 2013 Speed Loader. This is no ordinary speed loader, as you can see below. This is a speed loader on HGH (Heavy Gun Hormones). Certainly an unconventional size and design, the EF 2013 is said to be able to load your mid-cap mags 40 rounds at a time. According to the image above, there will be magwell adapters to fit the most common platforms currently available like the M4/M16, M14, G36, MP5 & AK47 mags.